What were the Castine Funds and how were they used to create a War of 1812 legacy in Nova Scotia? In September 1814, troops from the Halifax garrison, led by Sir John Coape Sherbrooke, successfully invaded the eastern coast of Maine in an effort that became known as the Castine Expedition. They soon gained control of St. Croix River to the Penobsot, and they used Castine as a customs port of entry for all goods traded through Maine, resulting in significant customs revenue. After the war ended, British troops withdrew from Maine in 1816 and took the more than 10,000 pounds they had collected as revenue with them. This fortune became known as the Castine Funds. Deciding that the funds should benefit Nova Scotia, the province’s Lieutenant Governor used 1,000 pounds to establish the Officer’s Garrison Library, the first in Halifax, now the Cambridge Military Library. Although the library was first housed in a private residence, it was later moved to an administration building, and then in 1886 to its current purpose-built location in Royal Artillery (RA) Park. The remainder of the Castine Funds was used to establish Dalhousie College, which later became Dalhousie University. Named for then Lieutenant Governor of Nova Scotia, the Earl of Dalhousie, the college was open to all, regardless of class or creed. The college’s first location was on Halifax’s Grand Parade, the location of today’s City Hall. Soon after the college was founded, Dalhousie left Halifax to become Canada’s Governor General and without his leadership, it took more than twenty years for the college to become operational, and another thirty years before the first degrees were awarded. “Halifax’s Officers Garrison Library” provides a brief history of the Royal Artillery Park Officers Mess. 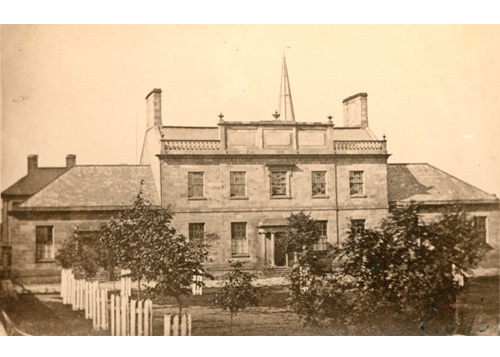 Dalhousie University provides a history of the school and its traditions in the resource “Dalhousie History and Tradition”. Sherbrooke Village provides a history of the village and its namesake, Sir John Coape Sherbrooke, in the resource “Sherbrooke Village History”.